Through quotations and dramatic images, Thomas Jefferson and 'the Boisterous Sea of Liberty' dynamically presents the radical ideas expressed in the Declaration of Independence that changed the world. Beginning with the notion of liberty as it was understood in the British Empire in the 18th century, the show charts how the ideas in the Declaration shaped the government of the new United States and ultimately spread around the globe. The title comes from Jefferson, who in 1820 wrote that "the boisterous sea of liberty is never without a wave." This highly interactive exhibition uses a wall of flat-panel LCD screens to present immersive images and sound along with interactive touch screens to engage users. Located in the Michelle Smith Gallery, the presentation on the wall of 14 screens is complemented by seven smaller, touchable screens giving visitors access to more than 250 image and text displays related to political, religious, and intellectual freedom. 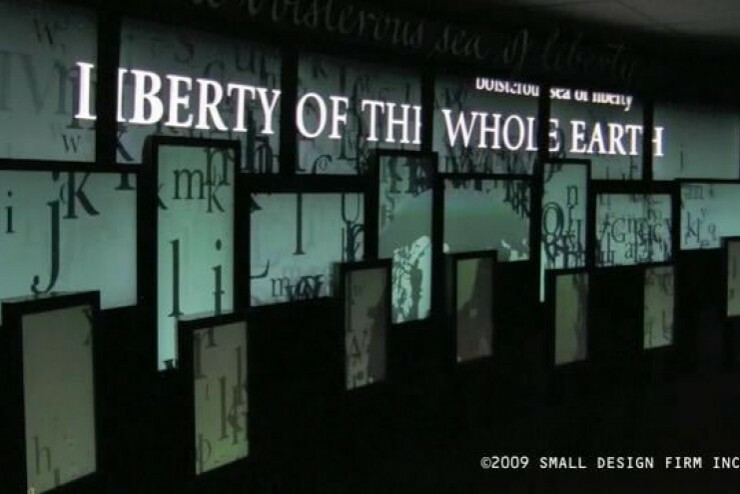 The digital elements in 'Boisterous Sea of Liberty' were created specifically for the exhibition by the Small Design Firm of Cambridge, Mass.